In need of a pop of color in your aquarium? Few fish will brighten up your tank like Mikrogeophagus ramirezi, also commonly known as the German blue ram. This dwarf cichlid is appreciated by aquarists for its bright oranges and electric blues, as well as its relatively mellow temperament. 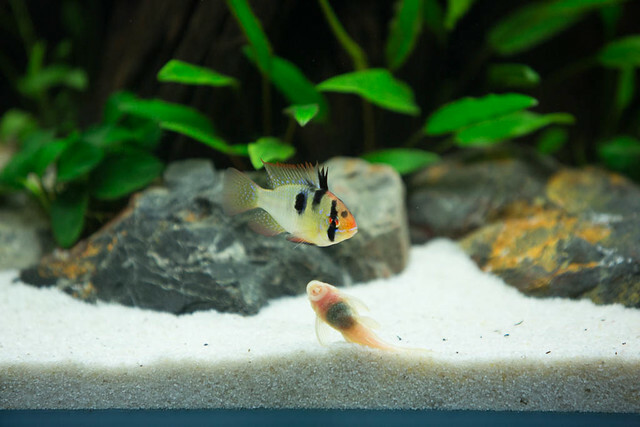 Although the German blue ram is not the easiest fish to keep in the aquarium due to its fragility, it does make a fantastic choice for the more experienced fishkeeper. You’ll love their colors, the way couples interact and maybe even setting up your own little ram breeding project. Keep reading for everything you need to know about keeping the German blue ram in your aquarium! German blue ram, blue ram, butterfly cichlid, Asian cichlid. German blue rams come from the rivers of Venezuela and Colombia, although can be found in other areas as well. The bodies of waters they inhabit are often choked with vegetation with low water flow, which is why it’s crucial to have lots of plants and driftwood to help them feel safe. This is especially true when introducing German blue rams to community aquariums. The German blue ram is a stunning fish that is guaranteed to be a showstopper in any home aquarium. It’s known for its vibrant yellow body, orange-gold face, bold black stripes and blotches, and iridescent blue shine. It’s almost guaranteed that even if you aren’t a fish lover, you’d see this beautiful creature and instantly fall in love! German blue ram variations include gold, electric blue, and balloon, just to name a few. Because German blue rams are dwarf cichlids, you won’t need a very large aquarium to keep them. A 15 gallon (57L) aquarium can be enough for a pair as long as it’s a long tank. Tall aquariums should always be a little larger, as they provide less valuable vertical swimming space. German blue rams naturally occur in habitats that are relatively slow-flowing and densely planted. The water can range in color from heavily tannin-stained to quite clear, but will always be soft and acidic. Additionally, it’s quite warm: temperatures of up to 84 °C/29 °F are no problem for the German blue ram. In the aquarium it’s a good idea to imitate these conditions as well as we can, as German blue rams are relatively weak due to inbreeding. Because of this they don’t respond well to unideal water values. Stay on top of your water changes, too, because bad water quality can quickly cause problems. Never introduce Mikrogeophagus ramirezi into an uncycled aquarium. Decoration-wise, your German blue rams won’t care much about what you use as long as there’s plenty of cover of some kind. A biotope-oriented tank with plenty of driftwood, plants and leaf litter would make a great choice. 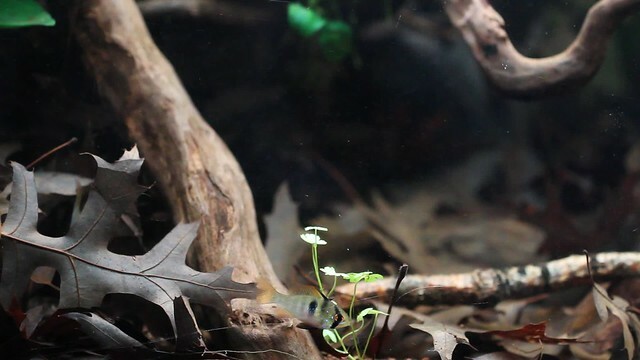 The leaves help keep these fragile fish healthy by releasing antibacterial/antifungal tannins and improve the feeling of safety by darkening the water. You can read more about them here. German blue rams are the stars of any community tank. Despite their fierce appearance, they are peaceful critters that have been known to school with other non-aggressive fish. Many fish that are popular in community settings can be kept with German blue rams. Because this cichlid species needs relatively soft and acidic water, try to find tankmates that appreciate similar conditions. Tetras, such as neon and black neon tetras, make a great choice for the middle water layer. Various peaceful catfish species like Corydoras and Ancistrus can add life to lower regions. Do always keep the personality of individual fish in mind as well: be prepared if you need to separate fish. It’s not recommended to keep German blue rams with shrimp since most shrimp species make a tempting snack! Additionally, your rams will not feel comfortable when combined with more assertive species. German blue rams are omnivores and enjoy a wide range of food. They’ll nibble on anything from wafers to live foods, such as bloodworms. The aforementioned shrimp actually make a fine German blue ram food as well: if you find yourself with an exploding colony of Neocaridina davidi, for example, your rams will gladly take some off your hands. Although you may be tempted to immediately start any new rams you’ve purchased on processed foods, it’s handy to have frozen and live foods readily available as well. 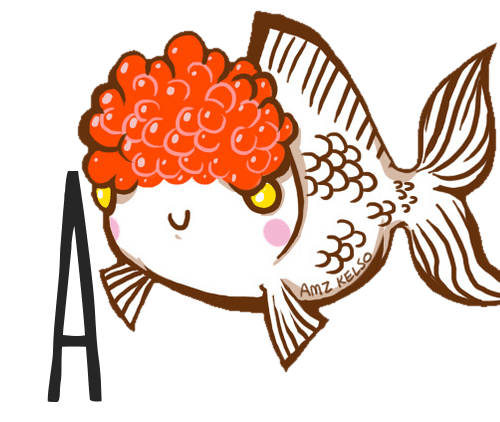 It’s not unusual for these fish to refuse processed foods in the beginning. Consider having a brine shrimp hatchery set up before you go out to buy your new rams. Since German blue rams are slow and shy eaters, it’s highly recommended to be patient and feed them separately. Otherwise, they’ll be outcompeted for food, if they are housed in a community tank. Compared to other cichlids, German blue rams are known for being relatively peaceful. Just provide plenty of cover and privacy in the form of live plants and coconut caves and you’ll rarely see your rams bother their tankmates. A bonded pair usually do well together, with the males only becoming more aggressive towards other fish when guarding eggs. Even then, breeding German blue rams don’t turn into the “terror of the tank” during spawning time like many other cichlids. 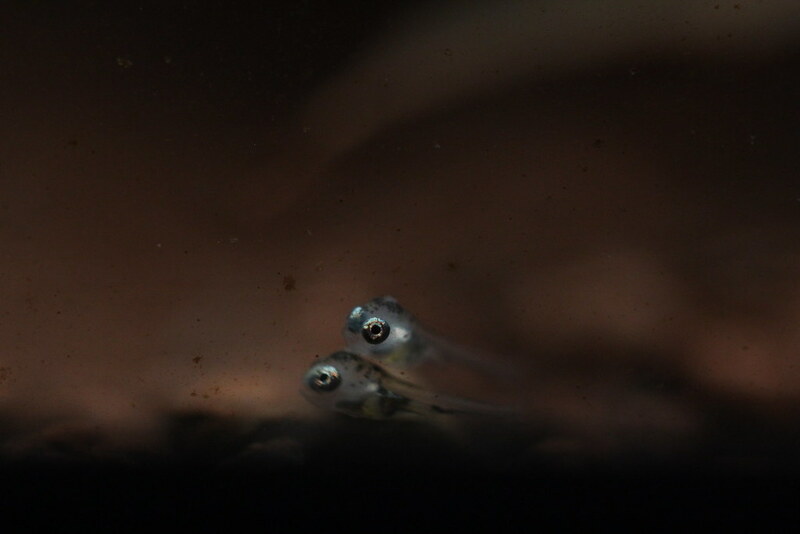 Although there are different spawning methods, depending on a breeder’s preferences and experience, it’s often best to keep the bonded pair in their own tank. Provide shallow, warm, and soft water to encourage spawning. Otherwise, if the rams are kept in a community tank, there’s a risk of other fish potentially eating the eggs or fry. When a female is ready to spawn, her belly turns a bright red. After the spawning is complete, she lays adhesive eggs to a surface and both parents work together to protect the eggs. They even wave their pectorals over the eggs to ensure that there’s adequate water flow. If the water temperature is in the mid 80s, the eggs will typically hatch in just 40 hours. Then five days after that, the free-swimming fry cluster around their parents to hunt for food. There seems to be some debate about how good captive-bred parents really are, with many hobbyists commenting that they fail to protect eggs or fry in community settings. Some people believe this to be an indicator that wild parents don’t have to worry so much about predation since their methods of spawning and rearing fry are not as strict as other cichlids. Other people argue that the poor parenting is due to the lack of genetic diversity, which has led to the fish simply no longer knowing how to produce and raise young. Some rams are also notorious for eating their own eggs after spawning. If you have a pair with an insatiable craving, you can try removing the eggs and artificially hatching/raising the fry yourself. The German blue ram is not a fish for beginners, despite its irresistible charm. It’s well-known in the hobby that these dwarf cichlids are not hardy. They are extremely sensitive to water conditions and easily become sick. In fact, you’ll often be lucky to have a ram live more than 18 months. Unfortunately, it’s believed that the German blue rams found at your local pet store are doomed to cause you heartache before you even bring them home. The belief is that they are mass-produced overseas and raised in antibacterial medications that build up resistance to diseases in home aquariums. Then, when the fish are shipped elsewhere and placed into new water, their immune systems take a hit. Another concern is that the fish are exposed to growth hormones and even injected with dye, which produce big, flashy fish that are pleasing to the eye for consumers. However, this often means a short, low-quality life for the fish. The best way to avoid supporting such practices is to buy locally. Instead of getting your fish from a big chain pet store, take a quick look for breeders in your city. Many hobbyists are more than happy to share the love. Finally, it’s important to know that even when you’re buying locally, German blue rams, including variations, all suffer from lack of genetic diversity. 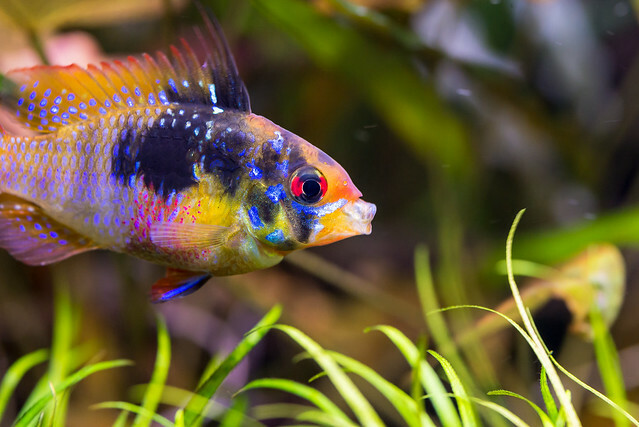 If you have any more questions about keeping German blue rams in your own aquarium or if you want to share your experiences with this colorful dwarf cichlid, don’t hesitate to leave a comment below.